When having money is all that matters, what happens when you lose it all? Perfect, picturesque Orchard Hill. It was the last thing Ally Ryan saw in the rear-view mirror as her mother drove them out of town and away from the shame of the scandal her father caused when his hedge fund went south and practically bankrupted all their friends — friends that liked having trust funds and new cars, and that didn’t like constant reminders that they had been swindled. So it was adios, Orchard Hill. Thanks for nothing. Now, two years later, Ally’s mother has landed a job back at the site of their downfall. So instead of Ally’s new low-key, happy life, it’ll be back into the snake pit with the likes of Shannen Moore and Hammond Ross. But then there’s Jake Graydon. Handsome, wealthy, bored Jake Graydon. He moved to town after Ally left and knows nothing of her scandal, but does know that he likes her. And she likes him. So off into the sunset they can go, right? Too bad Jake’s friends have a problem with his new crush since it would make Ally happy. And if anyone deserves to be unhappy, it’s Ally Ryan. Ally was hoping to have left all the drama in the past, but some things just can’t be forgotten. Isn’t there more to life than money? I’ve been reading so much fantasy lately that I remembered just recently why I avoided them before: information overload. Okay, it’s not information per se, but all these different worlds and creatures and everything out of the ordinary took its toll on my fluffy-loving brain that it declared a break. When I tried to pick up another novel that had to deal with supernatural creatures, my brain crossed her arms and shook her head. Loud and clear: Not now. I had to fold. After all, this is my brain. So last Sunday, I realized something: I don’t have anything fluffy to read. Okay, that is an exaggeration. I do have some non-fantasy books on my ever-growing TBR list, but somehow, I just didn’t feel like reading them. 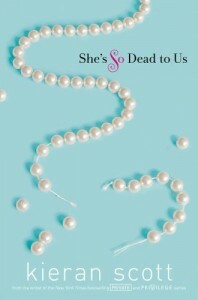 This always happens, and I know from experience that this is where the urge to get a new book always, always comes in…and by the end of the day, I have a new ebook loaded in my iPod Macy — Kieran Scott’s newest novel, She’s So Dead to Us. And enough of the introduction. Or maybe not. I’ve read only one Kieran Scott book, under her pseudonym Kate Brian, the first book in the Private series. I didn’t like it. I think Gossip Girl wasn’t on TV yet when I read that book, and I didn’t read the series, so I wasn’t really much into scandalous rich people boarding school stories. I didn’t bother picking up the next books in the series, and consequently, I didn’t pick up Kieran’s other books. I’m glad I picked up She’s So Dead to Us, though. The title piqued my interested because of the “dead”, and I thought it had zombies in it, but it didn’t. Instead, She’s So Dead to Us tells the story of Ally Ryan when she comes back to Orchard Hill after abruptly leaving when her dad lost their money and her friends’ parents’ money on a deal gone wrong. Ally is no longer rich, but still she hopes that the years of friendship would be a stronger than the amount of money she has in her account and somehow slip back into her old life. At first glance, this seems like one of your high-society rich-girl scandalous stories with spoiled rich guys who can get anything they want and girls who buy everything they want with their credit cards and down slimming pills so they’d always be a size 1, just like Kieran’s other series. At first I thought it would just be the story of Ally’s rise back to popularity, so I was ready for pretty much a lot of fluff. However, I was surprised to find out that this novel isn’t all just fluff — it’s actually quite deep. It was more than just a story of a formerly popular girl trying to regain her popularity. In fact, Ally didn’t really try to gain it back. We see how much Ally has grown up and keeps on growing up as the book goes by, and it’s good to see that in a character. What used to be all about money for her is different now that she’s on the other side of the fence. She saw and felt how it was to be a regular student in Orchard Hill, and she saw how she could be so mean when she was a part of the rich clique. I’m glad that Ally wasn’t written to pine after her old status, because I feel that’s too used already. It’s nice to read about a formerly popular character who wasn’t just all about popularity back then — in fact, I don’t think Ally ever complained about being unpopular. What she really wanted then was to have her friends back. Never mind the money or the popularity; she just wanted to be with the people she grew up with. Of course, it wouldn’t be that easy. I think Kieran really knows about the various social standings inside an American high school because even I was intimidated and pissed off at the popular clique. I’ve read and watched these popular cliques on TV, but Kieran’s portrayal felt the most real I’ve read so far. What I really liked about the antagonists in the story is they’re not just against Ally because she left them. There were deeper issues under Ally’s abandonment, dealing with the repercussions of Ally’s dad’s actions and their effects to the other families. I was particularly intrigued with Chloe and Shannen. Chloe, Ally’s best friend, is equivalent to the good side of Blair Waldorf in Gossip Girl: she’s the princess everyone wants to protect, the one who ended up being almost like Ally’s friend. Then there’s Shannen, Ally’s partner-in-crime, who is the evil side of Blair: her issues with Ally run deeper than the others, and she was a hateful character, really…yet I wanted to get to know more about her. That’s the good part of the “villains” in this novel; they’re not just villains to go against Ally. They were there because they felt that Ally hurt them, and they are having a problem seeing through all the mess to remember their friendship with her. It’s also easy to just focus on one major antagonist for Ally, but all of them had personalities of their own, even the ones they call the Idiot Twins. Not only that, but they also had a personality as a group, which may or may not be the same as their own personalities. This is peer pressure in a clique demonstrated at its finest: when one moves, the other follows, and it takes someone really strong to break the pattern. As for Jake Graydon…I liked him, but I felt there was something lacking in his narration that I can’t quite figure out. Jake is someone who seemed to be always caught in the middle, one who everyone wishes who would make the right choice and yet not make the right one. In a way, Jake is a typical male, and I hardly got to see what’s inside his head. Not that I mind that much, because Ally’s parts are always better. I hope I see more to his character in the sequel, though. Maybe there will be more of Jake’s point of view in the second and third books. I can’t say I’m a fan of trilogies, but the Victorians had their serial novels and Jane Eyre is good enough to make me try to be open minded about our own publishing trends. Hi. I’m over visiting from Book Review Wed. I have just added this to my TBR list on goodreads! Thanks.